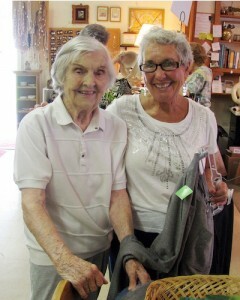 Doris Stout, left, with Second Chance manager Linda Horton. An unexpected shopper was 93-year-old Doris Stout, a resident of Pottersville, NJ, who was one of the Second Chance Shop’s founding volunteers. “A friend of mine, Betty Martin of Basking Ridge, and I signed up 30 years ago,” she recalled. She gave up her post because, she said, “I can’t stand up for a long time anymore.” But that didn’t stop her from coming back as a customer. Money raised by the Second Chance Shop is donated to Matheny to be used for equipment, technology and other gifts that directly assist Matheny students and patients. The shop’s new season will resume on Tuesday, September 2. This entry was posted in Uncategorized and tagged Doris Stout, Friends of Matheny, Second Chance Thrift Shop. Bookmark the permalink.